A 13-foot statue of William Wallace that infuriated historians because of its likeness to actor Mel Gibson, has been returned to its creator. The 12-tonne gold sandstone piece had stood at the Wallace Monument in Stirling for more than 10 years. However, it was removed last year to make way for a new visitor centre. Brechin-based sculptor Tom Church has now taken possession of the statue, which he said would be on permanent display at his gallery. When it was placed in the Wallace Monument car park in 1997, the statue attracted both derision and delight from those who saw it. 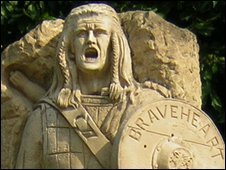 Despite criticism from historians because of its resemblance to the Braveheart actor, Mr Church said the statue had proved popular with tourists to the 19th century monument. Mr Church said he had been inspired to create the statue, which took him five months to carve, after watching the 1997 film. He said: "I know the purists didn't think too much of it but the tourists absolutely loved it. "I believe it's rightful home is at the Wallace Monument. It was the ideal place for it. "I think they were maybe a bit angry that some people just wanted their picture taken with the statue and didn't bother going into the monument." Ken Thomson from Stirling District Tourism, which manages the monument, said the controversy surrounding the statue had played no part in the decision to hand it back to Mr Church. He said: "For every letter we had criticising the statue, we had one saying how much people loved it. "It was a perfect example that you cannot please all of the people all of the time. "It was returned to the sculptor because the lease was at an end. It was a purely practical decision because we did not have the space for it with the new visitor centre." Mr Thomson said there were no immediate plans for any other statues at the monument. The 220ft Wallace Monument, which attracts more than 125,000 visitors a year, was opened in 1869 to commemorate the 13th Century patriot.